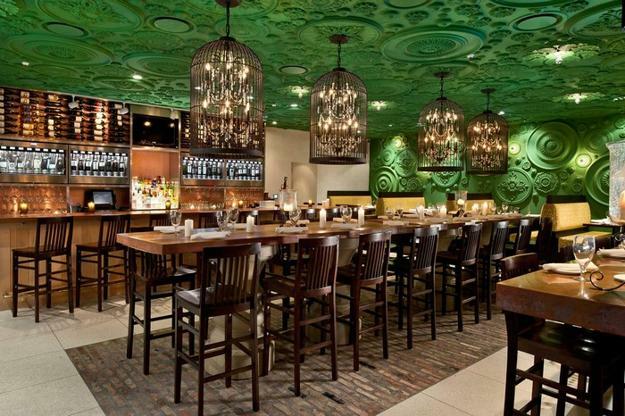 An amazing green ceiling designed with beautiful medallions and pop out light bulbs create this fantastic dining room. Barbatella’s bar features a long wood table, birdcage chandeliers, and warm yellow upholstery, creating the beautiful place for all who appreciate sophistication and creativity. 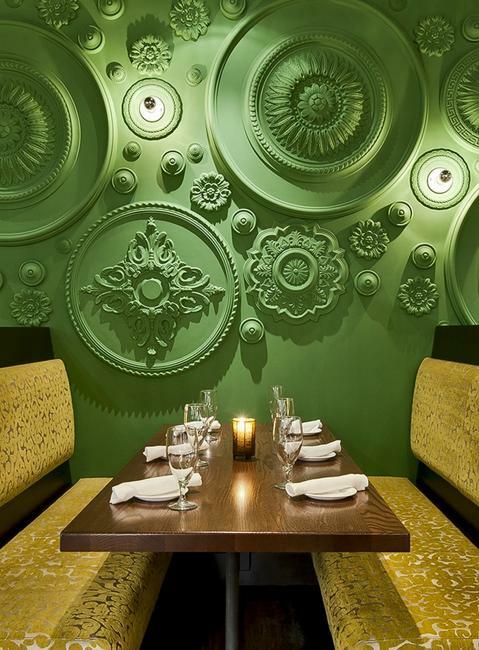 Modern interior design and vibrant colors blend into the fabulous ceiling and wall designs. Barbatella restaurant in Old Naples, Florida does not leave anybody indifferent, and offers something unique to fans of the Italian atmosphere. Floral ceiling designs, green leaves and bird cage lights, yellow upholstery fabrics and wooden furniture remind of rural landscapes, grape wines, and warmth of Italy. The idea of medallion ceiling and wall decorations is elegantly simple and stylish. 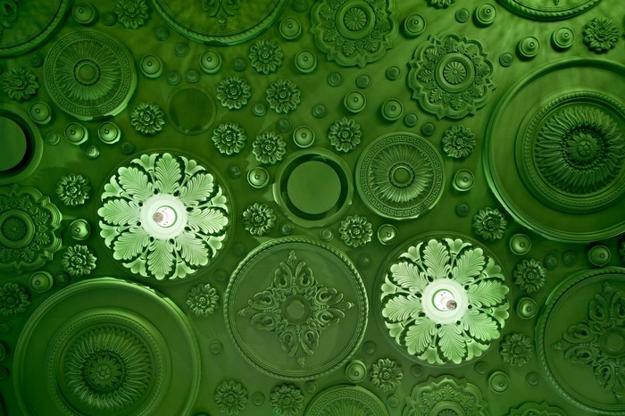 It provides great inspiration for ceiling and wall designs. Home interior decorating with ornaments, lights and green colors will look inviting and unique. 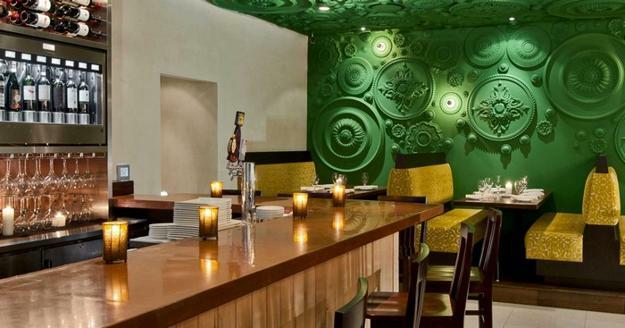 Green and yellow create fascinating color combinations that feel pleasant and harmonious. Chef Fabrizio Aielli knew what he wanted in his new restaurant blending Italian vibe with creative and impressive interior design ideas. 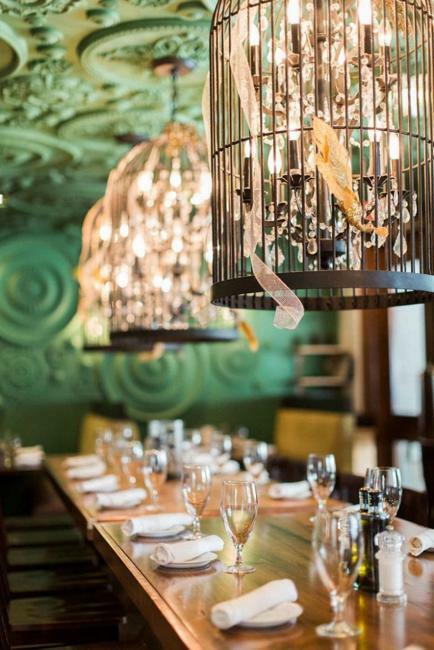 Wooden furniture, original birdcage lights, floral and leaf designs create this comfortable green place where old world charm meets elegance.